Porthcawl Museum has been awarded Full Museum Accreditation Status, for the third time. The wonderful news, which was received on Wednesday, is the culmination of a lot of hard work and dedication from Museum volunteers. The award, which is reviewed every four years, recognizes that Porthcawl Museum has again attained the National standard in museum management, collection care and public service. The standards, which have proved to be higher than in previous years, are set by the Welsh Government in partnership with Arts Council England and are not easily won. The application, which took three months to complete, was submitted on 28th February. In May, Phil Wensley, an advisor from the Welsh Government Museums Standards and Performance, visited the Museum to assess and verify that what had been submitted, was correct. Although, Phil Wensley made every effort to put volunteers at their ease, it still proved a long anxious day, as he inspected every area within the organisation. The trustees, committee, volunteers and members are thrilled and proud to have achieved the award, which not only maintains Porthcawl Museum’s Accreditation Status, but also is essential in the development of the museum. The museum was visited today (Friday) by The First Minister of Wales Carwyn Jones AM who on being told the news, commented, I am delighted that Porthcawl Museum has achieved full accreditation. This is a great tribute to the many hours put in by the volunteers to run the museum. My congratulations to all those involved. The town can be very proud of its museum and the people who help to run it. 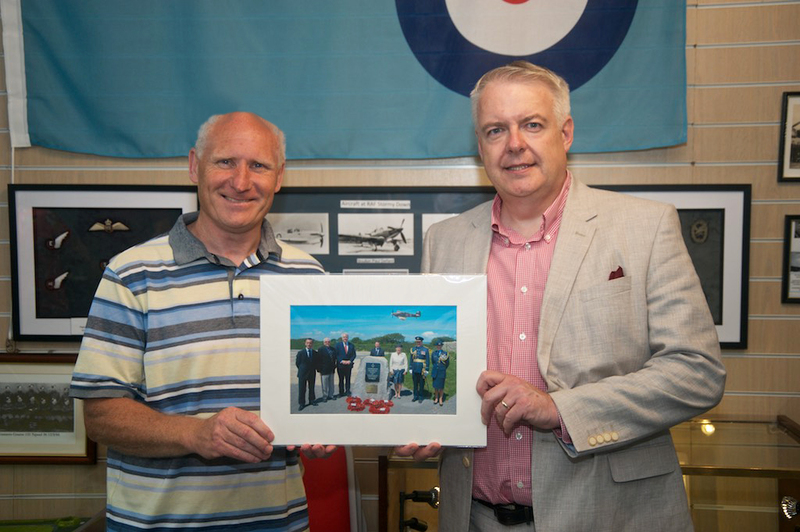 Museum chairman, Paul Joseph presented Mr Jones with a composite photograph following the previous weeks dedication service of the memorial to the RAF and allied service men and women who had served at RAF Stormy Down.